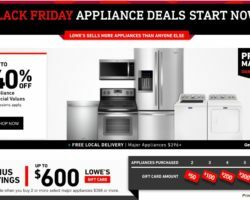 View Lowes Black Friday 2015 ad. 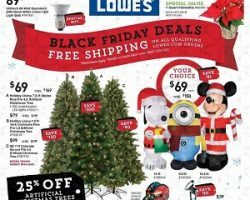 Save with this year Lowes Black Friday deals on electric dyers, French door refrigerators, artificial Christmas trees, holiday decor and seasonal items, hammer drills and other power tools, drill bit sets, standard mechanics tools sets and fire resistant, waterproof chest safes. 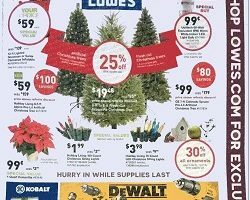 Lowe’s Black Friday Sales 2019. 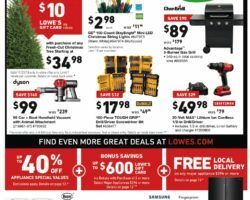 Find Lowe’s Black Friday ad, deals and sales for 2019 from blacknfriday.com. Lowe’s is an American retail company that today operates approximately 1,900 stores in the U.S., in Canada, Mexico and Australia. The company was established in 1946 in North Wilkesboro, North Carolina and is nowadays headquartered in Mooresville. 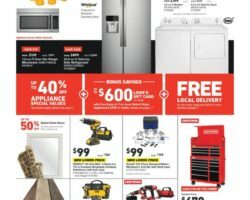 The retailer sells top brands home improvement products, tools and appliances, among the retailer’s featured categories being air conditioners & fans, dishwashers, multipurpose flooring, child safety, multi-game tables, hand tools, Christmas decorations and hardware lubricants. 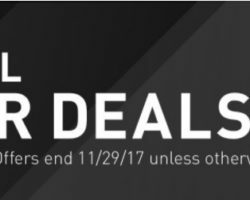 In addition to offering savings on a weekly basis, the retailer provides best prices storewide during every year’s Black Friday event. 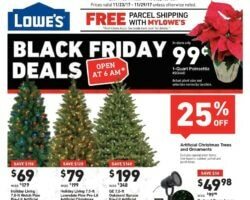 The last year Lowe’s Black Friday sale featured exclusive online deals as well as a range of in store savings. 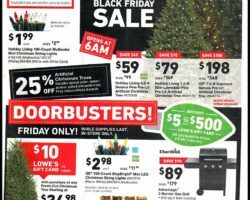 The retailer cut prices up to 30% on Christmas decorations and 25% on fresh cut Christmas trees, featured savings up to 40% off select major appliances, included specially priced combo kits with a free bare tool and many other savings for top of the line tools. Qualifying online purchases of $19 and more received free delivery.